English pole dance, aerial hoop/tissu, burlesque, contortion classes in the heart of Tokyo. The only multi-language pole dance studio and the largest in Japan with world champion instructors. Welcome to Pole Dance Tokyo! Are you ready to take your very first class at our studio? Let’s start! Please choose a class that fits your experience level from our class schedule and reserve your spot online. Please choose Beginner class if you have little or no pole dance/aerial dance experience. 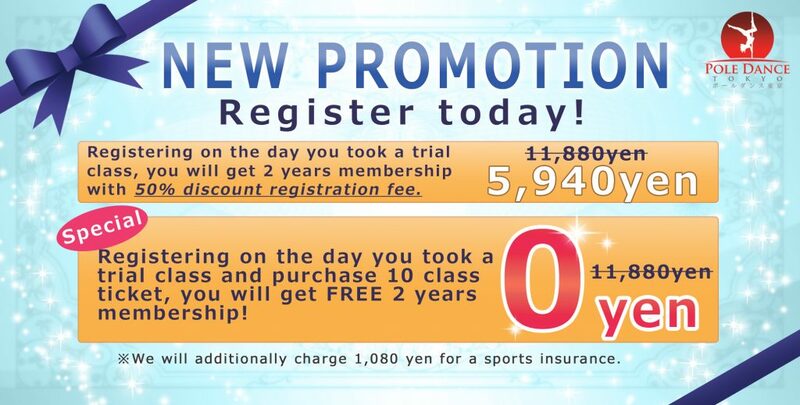 Your first class will be 2,500 yen as a trial fee. 2. See you at the studio! Please arrive 10 minutes before the class. Don’t worry! Our basic class is for the absolute beginner! All our instructors are very friendly, we are committed to teaching slowly and carefully. Wishing to take a class in English? Please choose Diana’s class. All our other instructors speak basic conversational English. Please take a look Q&A . In order to prevent injuries, we start with a warm-up. Fully stretch the body using the pole! A walking exercise around the pole focusing on landing on the tips of your toes. Walking beautifully leads to proper posture! Gain momentum while walking, hook one leg on the pole and spin! Relax, use your body weight and let the centrifugal force take care of your body. Try out a simple dance! Using the walk and spins that you just practiced, we create a simple choreograph routine and dance it to the music. Showtime! We end with a simple stretch to loosen the muscles. Well done! Copyright 2015, Pole Dance Tokyo All rights reserved.